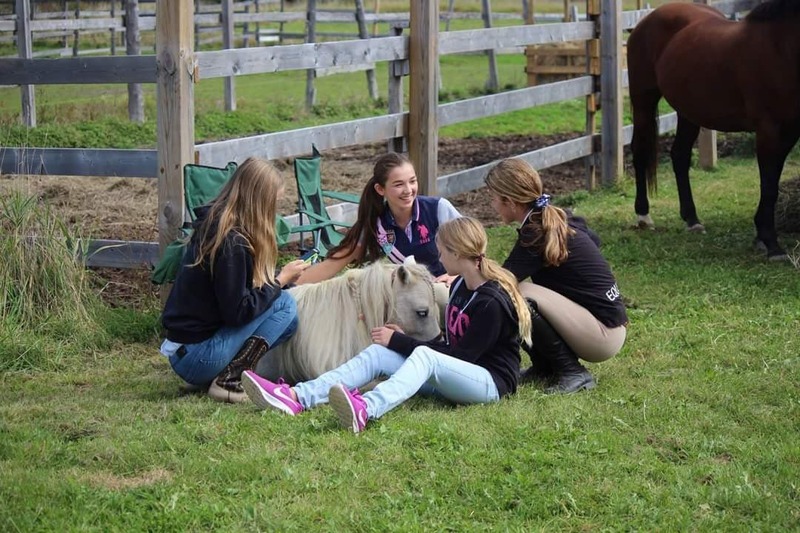 ﻿﻿The lesson program at Strathclair Farm builds friends, fun and community by teaching riders safety, accountability, respect and compassion for horses. We have a wonderful selection of "clubbies" or school horses to suit beginner through to advanced riders and have instructors for both Western and English. Western lessons are available by request only. In the lessons, proper grooming, tacking and handling of the horses is emphasized so students not only establish good riding techniques but also good horsemanship skills that provide happy, healthy horses. in a weekly 1-hour class. A $25 administration fee will be charged per block if making payments. No fee if paid in full during registration. ​Please see the events calendar for important dates. Payments can be made via cash or cheque or e-transfer (please use "Rider's last name" for the answer/password). If using a Club horse, there is a fee of $15.00 per lesson. ​Lesson's are reserved in blocks of 6 and payment is due prior to beginning your first lesson. Please note that privates are not guaranteed - this will depend on the amount of riders interested in taking lessons. We will make every effort to try and accommodate however. If anyone is interested in participating in lessons with Tina, please email with your interest. ﻿﻿ ​Brandon Davis began riding at the age of 6. He began riding competitively at the age of 8 and throughout the years, was able to successfully compete in several different divisions of the Trillium Hunter Jumper Circuit, including the Annual Championship Show. He has also successfully competed in several sanctioned competitions in the Traverse City Area. Brandon has always had a passion for anything to do with horses. He volunteered for organizations such as Therapeutic Ride Algoma. He also spends several weeks every summer at his aunt’s horse farm in Southern Ontario where he has been exposed to reigning and cutting. When not working as a Registered Practical Nurse for the Group Health Centre, Brandon can usually be found at Strathclair Farm with his horse Peach. Brandon is eager to share his knowledge and passion for horses with other riders at Strathclair Farm. Deena Eddy began taking weekly riding lessons at a local riding school at the age of 6. Over the years she progressed to two lessons per week, then part boarding of school horses, full leasing of privately owned horses and eventually purchasing her own horse. Growing up she enjoyed taking school horses to local shows. She now owns two horses, Cosmo and Rugged Voyager, which are boarded at Strathclair Farm. Deena is an Ontario Certified Teacher employed by Algoma District School Board and is the Grade 4/5 Teacher at Central Algoma Elementary School for the 2018/2019 school year. Deena has obtained her English Rider Level 6 with the jumping module through Ontario Equestrian and has successfully completed the National Coaching Certification Program in Equestrian Theory while she actively pursues her National Coaching Certification. She has been teaching riding lessons at Strathclair Farm and other local riding programs off and on since 2009. While Deena is interested in learning about all equestrian disciplines, she has a special passion for the Hunters. Hilary Rock has been riding for 19 years in many different disciplines with her main focus being equitation, hunters, and jumpers. She has her OEF English Rider Level Six and looks forward to completing the competitive coach certification. Hilary was a riding instructor at Strathclair Farms for many years before she went out of town for University. While attending Western University, Hilary competed successfully in both the OUEA and IHSA. As well as competing she was the Collegiate Coach of the International IHSA Hunt Seat Team at Western through the USHJA. In the past, she has worked at numerous different show barns as a day and overnight camp counselor, doing general barn chores, a show groom, instructor, working and training horses, etc. Throughout her competitive years she has received recognition for many accomplishments with her most valued achievement being the THJA Sportsmanship Award. She hopes to continue to share her passion and expertise within the equestrian world.